You can use the following toothbrush history as part of your child dental care programme. Your child will definately enjoy a story in addition to their daily brushing of teeth! Brushing teeth, a common activity today, has been around for a long time. The early history and evolution of the toothbrush has its origin in the "chewingsticks" used by the Babylonians as early as 3500 BC. Ancient Greek and Roman literature even discusses primitive toothpicks that were chewed on to help clean the teeth and mouth. As the years passed, toothpicks matured into the chew stick which was about the size of a modern pencil. One end was chewed into and became softened and brush-like while the opposite end was pointed and used as a pick to clean food and debris from between the teeth. The twigs used were carefully chosen from aromatic trees that had the ability to clean and freshen the mouth. The earliest literature showing the use of these twigs is found in Chinese literature at around 1600 BC. The toothbrush was first invented by the Chinese in the XVth century and brought back to Europe by travellers. This toothbrush was made of hairs from the neck of a Siberian wild boar which were fixed to a bamboo or bone handle. The people, however, found the wild boar hairs too stiff. At the time, very few people in the Western world brushed their teeth, and those who did preferred horse hairs, which were softer than those of the wild boar! In Europe, it was more customary after meals to use a goose feather toothpick, or one made of silver or copper. Other animals’ hair was also used for dental care, right up until this century. But it was the poor Siberian wild boar that took the brunt of it. The animal was imported for its neck hairs for a long, long time... in fact, until nylon was invented, in the XXth century! French dentists, promoted the European use of toothbrushes in the seventeenth and early eighteenth centuries. The first toothbrush mass-produced was made by William Addis of Clerkenwald, England. Addis, and later, his descendants, manufactured the finest English brushes, where the handles were carved out of the bone of cattle and the heads of the natural bristles were placed in the bored holes made in the bone and kept in place by thin wire. The natural bristles were obtained from the necks and shoulders of swine, especially from pigs living in colder climates like Siberia and China. The first American to patent a toothbrush was H. N. Wadsworth in 1857. Companies began to mass-produce toothbrushes in America around 1885. The Pro-phy-lac-tic brush made by the Florence Manufacturing Company of Massachusetts is a good example of an early American made toothbrush. The same company was also the first to sell toothbrushes packaged in boxes. In 1937, in the Du Pont laboratories in Nemours, U.S., nylon was invented by Wallace H. Carothers. In 1938, this new material became a symbol of modernism and prosperity through the commercialization of nylon stockings and of Dr. West’s miracle toothbrush with nylon bristles. The first real electric toothbrush was produced in 1939, developed in Switzerland. The electrical toothbrush was first marketed in the United States in 1960 by Squibb. The brush was called the Broxodent. General Electric introduced a rechargeable cordless toothbrush in 1961. Interplak was the first rotary action electrical toothbrush for home use, introduced in 1987. 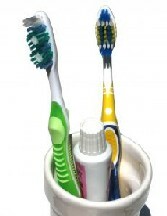 Today the brands, types, and colours of toothbrushes on the market are almost endless. In spite of this, certain African and American populations still use tree branches to care for their teeth! L’origine merveilleuse des choses de tous les jours, Charles Panati, Éditions F1RST, 1989. Le livre mondial des inventions, sous la direction de Valérie-Anne Giscard d’Estaing, Éditions Fixot, 1996 et 1997.